That will make both of you happier! There are many reasons to play games with your dog. It will strengthen your relationship. It will keep the dog from getting bored, which will keep him from things you don’t want him doing, and make him healthier. Many of the games described here will actually help train your dog. It’s important that you can establish control of your dog even when he’s very excited. And finally, most people get a dog for companionship — isn’t playing with your dog the whole point? One thing to keep in mind is your attitude while playing. Most dogs will have fun if it’s clear you’re having fun, too. When you are out of sight of your dog, call her to you. You can either use your normal “recall” command or just her name. Be very excited when she arrives. Start making it more difficult by “hiding” behind doors, couches, etc. If she doesn’t find you at first, call her again. If your dog is very good at “stay” you can use this to keep her in place while you hide. Get a box or bucket and collect a number of toys and other dog-safe items (don’t start with things your dog likes to hoard or that you don’t want them ever touching). Scatter the toys in a small pile on the floor. Through shaping and teasing, get the dog to pick up the items one at a time, and place them in your hand. Once the dog is lifting the items high enough to get your hand underneath to receive, you are well started. Be sure to reward each “gift” with a food treat. If you have the right attitude, you can make obedience training a game. Let your dog prove how clever she or he is by sitting when you say “sit”, lying down when you say “down”, etc. Try it when your eyes are closed, your back is to the dog, or you are in a different position like lying down or even standing on your head! Mix up “drop it”, “take it/get it”, “hold it”, and “leave it”. Some dogs are natural fetchers, others are not. All can learn to enjoy this game. Be sure to teach and practice “drop it” first. If your dog refuses to return the ball (and this is pretty instinctive! ), or drops it too far away, end the game in disgust. Don’t turn “fetch” into “keep away”! “Fetch” can be shaped by rewarding interest in a toy, then approaching a toy, then touching it, then mouthing it, then picking it up. Use a clicker to click-and-treat faster retrieves, catches in the air, or a neater return. The secret to playing this game successfully is for you, the human, to control it. For this game, choose one particular toy that will be used as your tug rope (don’t use one of your socks, or food items, or the leash!). Never play tug with any other toy. You start the game by picking up the toy and encouraging your dog to also pick it up. Give a particular cue that the game has started, like “Let’s tug!”. Some dogs will refuse to do this with you, especially if they’ve been punished for tugging in the past. You can start small by clicking and treating them for holding one end while you hold the other. However, tugging is instinctive for dogs (it’s a cooperative act in packmate feeding) so your dog should catch on quickly. Tug a few times, then tell your dog “drop it”. (You can use the same cheerful tone of voice you use for “sit” or “come”). You can reward him for dropping it with either a treat or another round of tug (preceded by “Let’s tug!”). Make sure that you end the game if your dog gets too rough or agitated. Simply ask for “drop it”, praise for it, and put the toy away. If the dog refuses to let go, you let go of your end and walk away (it takes two to tug). Don’t try to take the toy back because that will be starting the game over. Ignore the dog if she or he tries to start the game. Wait until she or he has stopped bugging you and is doing something your want to reward (even if that’s lying quietly). Practice Tug – Drop it – Tug – Drop it. If the dog starts anticipating and grabs the toy, drop your end and leave in disgust. You decide when the game is over; reward the last “drop it” and then put the toy away where the dog can’t get it. 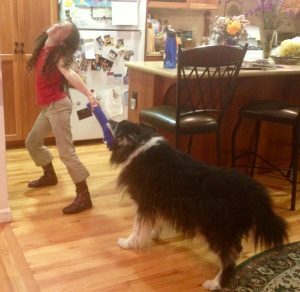 “Some trainers (e.g., Kilcommons, 1992) have suggested that owners should not engage in tug-of-war games with their dog because it may provoke dominance aggression problems. Behavior in Dogs, p. 332. Ottawa: DogPsych Publishing. Some books will warn against this because of the fear that the dog will try to establish dominance, or that the dog will refuse to drop other items (see side box). Dogs and wolves do not try to establish dominance through tug-of-war games, and the fact that you start and stop it the game at your will maintains your “dominance”. If your dog has a problem with guarding items or refuses to drop things, work on that first. One way to train “drop it” is to give the dog a large item to hold, then offer a very desirable treat in exchange. Be patient — don’t try to chase the dog around, offering the treat (why should the dog take food from you when getting chased by you is so much fun? See “Keep Away”, below). When the dog goes for the treat, click as soon as the toy is dropped and give the treat. Don’t grab for the toy yourself. If the dog picks it up again, try another exchange. When the dog is dropping the toy regularly, start giving the cue “drop it” before each treat offer. See more information on playing “tug” from ClickerTraining.com and from SF/SPCA. Like tug-of-war, this is a fun game your dog will enjoy while you continue to establish control. Again, choose one item. Give it to your dog and give some cue like “keep away!” (Jean Donaldson and I use”I’m gonna GET ya!”). It helps to use consistent body language, too — exaggerated stalking or reaching pose. Chase your dog, repeating your cue. End with an “OK, good dog!” and then ignore any of her or his attempts to get the game started again. Remember, you start the game and you end it. So this is how it goes: you say, “I’m gonna GET you” and you chase the dog for a few steps, and the dog runs away laughing. You then call the dog to you and reward him for coming, then say “I’m gonna GET you” again and chase him. After a few repetitions you might ask for a “sit”, “down” or other command instead of “come”. It’s another impulse-control game, with the reward being the chase-away. If he does not respond to your command, you say “oh well” and walk (or run!) off to do something else. Of course when you really do want to get your dog, or take something from him, you use a different command (I use “give me that!”) and different body language (I stand up straight and walk like I mean business).